Sitting on a gently rocking boat and sitting in a baby swing are probably two of the fastest ways to put a baby to sleep. Armed with this knowledge, a North Carolina man had what you might call a Reese’s Peanut Butter Cup Moment and invented the SearocK – a baby seat designed for use on the boat. We met the SearocK’s inventor, Billy Taylor – a passionate father and boater - and saw the product in action when it debuted at the New England Boat Show earlier this year, and again at the Newport show just this month. We were impressed. At first glance, the SearocK looks like your average baby swing. But it’s much more. It has a tray for small toys or food, a faux fishing rod holder, and is made of marine grade materials to withstand the elements of salt and weather. The SearocK baby seat is crafted to hang under any sturdy boat top (thus protecting the child from the sun) using a 4-point harness. 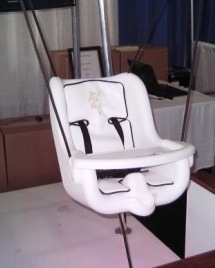 For added safety, it has a stabilizer chord below the seat to keep it from swinging too high or hitting anything. The product’s website warns, however, that the SearocK is for use only in no-wake areas and should never be used while a vessel is underway. 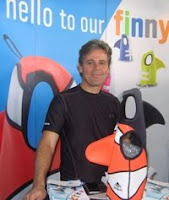 If you have a boat and a child between the ages of 6 months and 3 years old, be sure to check out the SearocK at www.babysearock.com. If you boat in Connecticut, Rhode Island or Massachusetts, or hope to someday, you can now visit FirstBoat.com first for local boating information. We will soon be adding local boating resources for other parts of the United States as well, but we are starting with our own stomping grounds of Southern New England. We thought maybe we could help some folks while we still have a few more weeks of decent boating weather. So if you boat in New England, or plan to someday, we hope our free local boating resources help you enjoy your time on the water. Let us know what you think, or if there's anything you'd like to see added in the future. Not in New England? No problem! Please let us know which states you'd like to see us "beef up" with more local boating resources - comment below or send us an email. There were some dramatic rescues on the water and boating incidents around the world over the weekend. Following are a few that caught our attention. Meet us in Boston this weekend for the return of Boston’s Fall Boat Show, October 1 – 3, at the Seaport World Trade Center. Coupons for discounted tickets are available at bostonfallboatshow.com. In Seattle, the Rachel Marie, a ferry carrying 73 people, crashed into the town dock sending seven passengers to the hospital. Lots of photos, video and eyewitness testimony on the West Seattle Blog. Five men who had been fishing over the weekend were found alive in the Indian Ocean by rescuers several hours after their catamaran sank in high seas. 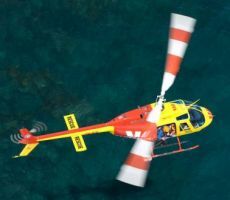 According to ABC.net.au, an EPIRB saved their life. Block Island Police Chief Vincent Carlone is being recognized as a hero after saving the lives of two fishermen who were struggling to hold on to the bow of their overturned 34-foot boat in heavy swells on Sunday. The fishermen and their sunken boat, the “Free Spirit”, were relatively close to shore, but huge waves and jagged rocks prevented rescuers from reaching them. The Block Island Times reports that rescue personnel determined that the best course of action would be for the police chief to put on snorkeling gear and swim to the fishermen, prompting one of those rescued to say it was like being saved by Aquaman. The two men, one of whom had served in the Coast Guard, were not wearing life jackets. Have any of these stories reminded you about the importance of wearing a life jacket? 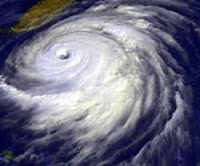 Now would be a good time to visit our boating safety page on FirstBoat.com. The title says it all – there are big boating events going on this weekend at Norwalk Cove in Norwalk, Connecticut, at Metro Beach in Mt. Clemens, Michigan, and at Lido Marina Village in Newport Beach, California. And if you happen to be in Europe right now, head to the Monaco Yacht Show where, if you like luxurious super and mega-yachts, you will not be disappointed. Links and directions in our boat show calendar. All of these shows have something unique to offer, and all have boats on display in the water. 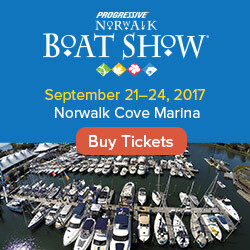 We’ll be walking the Norwalk show on Thursday wearing FirstBoat gear – spot us, say hello, and you will win a FirstBoat hat or t-shirt. This was a lot of fun when we did it in Newport last week and we're looking forward to doing it again and meeting more of you in Connecticut. We are looking forward to the return of the Boston Fall Boat Show next weekend, October 1st to the 3rd at the Seaport World Trade Center. Our friends from Boat Name Gear will be exhibiting and giving away all kinds of free gear. There’s a new iPhone app available for boaters, and its developers say it is far more comprehensive than any other boating app out there. Oneupweb, the agency that released Boat Load, say it was designed to help any and all boaters on the water. The app is essentially a nicely packaged bundle of several boating features found in numerous other boating apps, but that bundling is also what makes it so useful. From one place on your iPhone you now have access to several important tools, including weather forecasts and data and tide tables, integrated GPS and mapping for marinas, point-of-interest (POI) trip planning tools and shopping and maintenance notes. There are also several features on the Boat Load app that can help make boating safer. The app makes real-time float plans easy to create and share. Anything that makes it easier to remember to use a float plan is worth five bucks in our book. Also, the app’s two-tap SOS button activates and confirms an emergency 911 call. This is great when close to shore, and as a back-up to a VHF radio, but never depend solely on a phone for boating safety. The company also claims you can file instant insurance claims with this app, but we didn’t want to have to put ourselves in a position to test this "claim" (ha ha). Oneupweb has created other mobile apps, but the Boat Load app was born out of the company’s connection with and passion for the water. Their Traverse City offices overlook beautiful Traverse Bay, many of Oneupweb’s employees are avid boating enthusiasts, and the company’s CEO, Lisa Wehr, can be found on her pontoon boat all summer long. 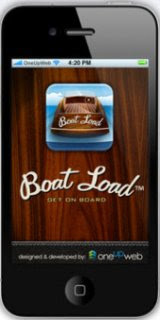 The Boat Load app is currently only available for the iPhone, with no set plans to port it to the Droid or Blackberry. You can get it in the iTunes store for a one-time download fee of $4.99. There were several boating mishaps over the weekend. Some of them were tragic, some dramatic and some just plain strange, but most have boating safety lessons you can take away from them. We’ll start with our headline story. People watched a man struggle to get his boat to shore for more than 24 hours before the onlookers called authorities in to help him. When the helicopter arrived, the captain wanted to stay with his ship, but as you’ll see in this amazing video, they got him just in time. Usually reports of people who fall overboard and go missing end very badly, but no matter the outcome they are usually found in or near the water. WTVM reports that was not the case for a Savannah Georgia man on Sunday who was found alive in the woods after a 7-hour search. Pakistan has an Environmental Protection Agency? When you see a headline like “3 held for motorboating”, your first instinct might be that the newspaper left off a couple of words such as “while drunk”, or “in a stolen boat”. But yesterday, 3 men were reported as being arrested and their boats confiscated by police. Why? Because they were on Rawal Lake in Pakistan, where boating was banned by the country’s EPA earlier this month. On Sunday afternoon in Florida, the owner of a 22-foot Sea Cat called 911 on a cell phone according to ABC Action News. But his sinking boat had drifted more than a mile and a half away from where he made the call, so by the time the Coast Guard located the vessel all three passengers were in the water. Luckily all three were wearing life jackets and were safely rescued. Details in stories like this are always vague, but could a handheld VHF radio made this rescue go a little more smoothly by allowing continuous communication between the Coast Guard and distressed boaters? Both coasts of the US are hosting boat shows today through Sunday the 19th. 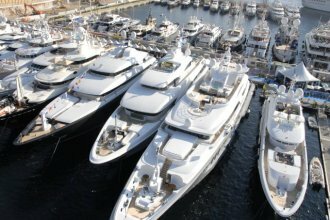 The Newport International Boat Show kicks off today in Rhode Island, celebrating its 40th anniversary. If you go today (Thursday), and you see our publisher walking around wearing a FirstBoat polo shirt, say 'hello' and he will give you a free FirstBoat hat or t-Shirt. 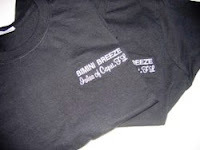 If you miss it, don't worry - you'll have another chance to win at the Boston Fall Boat Show in two weeks. The west coast has several nautical festivities this weekend, including the Northern California Fall Boat Show in Oakland, the Central Oregon RV Dealers Association Fall RV and Boat Show and Sale (Redmond, Or), and the Boats Afloat Show in Seattle. 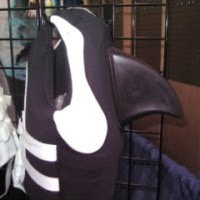 The PSP Southampton Boat Show is still going on, and today is Ladies Day at the show - all day Thursday. If you were disappointed that Lake Erie Boat Week was canceled last week, don't despair. Yesterday was the first day of the North American In-Water Boat Show, just 10 miles up the road, at Cedar Point in Sandusky, Ohio. For info about more nautical events, and links to the official websites of all of this weekend's shows, visit our calendar of boat shows. It’s time to name some boats… for a chance to win free stuff. Some people say naming a boat is harder than naming a baby or a pet. We have a website full of new boat owners that really need your help picking out a boat name. 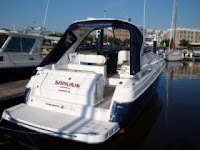 The Boat Name Blog is one of our sister sites. 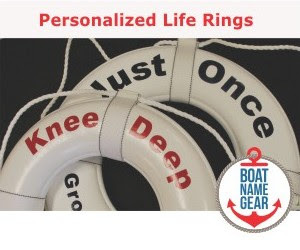 Over the past few weeks, a lot of people have sent their stories into the Boat Name Blog – all of them looking for help in choosing a boat name. When, How Often, More Details! Any comments dated in September can win this month, even if your boat name suggestions are for requests for help that are dated prior to the start of the month. You can suggest as many boat names as you want, just please keep them clean, and don't post as 'anonymous' or we won't be able to contact you to tell you if you won. This is not a best boat name contest, we'll pick winners randomly. The clock re-sets on October 1st, so come back next month to try to win again. We're doing this every month - at least until the end of the year. 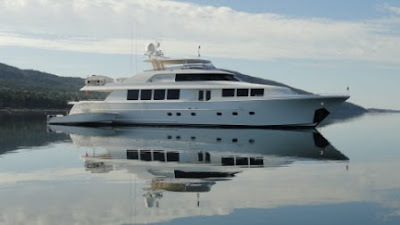 Some of the folks at the blog have an idea of what they want their name to be about, some of them have pictures of their boats, but many of them are a blank slate. So if you’re feeling just a little creative, and want to try to win some prizes while helping some fellow boaters, please visit the Boat Name Blog and suggest some boat names now. If you wanted to go to a boat show before the summer ends, this weekend may be your best chance. There are boat shows everywhere between now and Sunday the 13th. 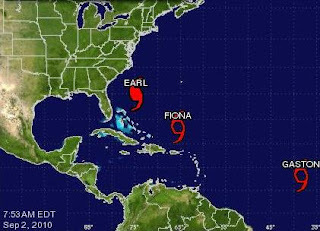 Tampa, Florida and Atlantic City, New Jersey are hosting shows on the east coast this weekend. Out west there are boat shows in Long Beach, California, and Port Townsend, Washington, as well as in Vancouver, British Columbia. 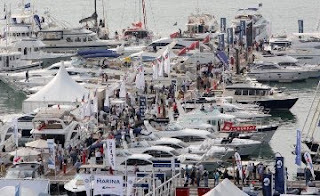 Among the larger shows are two events in Europe: the PSP Southampton Boat Show, which starts Friday (9/10) and is on all next week, and Cannes, which started yesterday and goes through Sunday. Back in the US, the second annual Lake Erie Boat Week has been canceled. Event organizer Janie Vogel stated on the event's website that despite the best efforts by those involved, putting on the show was "... not possible due to difficult circumstances beyond my control that made it impossible to continue." We are just three weeks away from the Boston Fall Boat Show, which has promised to offer discounted tickets to visitors of their website. For info about more events going on now and in the near future, and links to the official websites of all of this weekend's shows, visit our calendar of boat shows. This weekend, it's gotta be Buffett, but which song? Each Friday we pick what we call the Sea Song of the Week to help you set a nautical tone for the weekend - even if you can't be on the water.